Nathan Abrams receives funding from The British Academy. As Dawn of the Planet of the Apes opens, it’s worth remembering that the racial conflicts and the struggle for civil rights in the 1960s underpin the original films. The traditional evolutionary hierarchy is inverted. Apes are superior to humans and humans (who are unable to speak) are viewed as mere animals by the apes. That sly allegory was hatefully perverted by white supremacists, even deemed derogatory by some in the Black Power movement, but its provocation is unmistakable as one directed against the forces of institutionalised racism. But there’s another element to this allegory that is not often commented upon. It’s not just a struggle of ape vs. human (read, black vs. white), but can been seen in terms of the struggle of other minorities. This is particularly true in the case of Jewish Americans. The inspiration for Planet of the Apes came from Rod Serling, who co-wrote the screenplay, and was raised Jewish. Born in New York State in 1924, Serling was part of a Reform Jewish family. 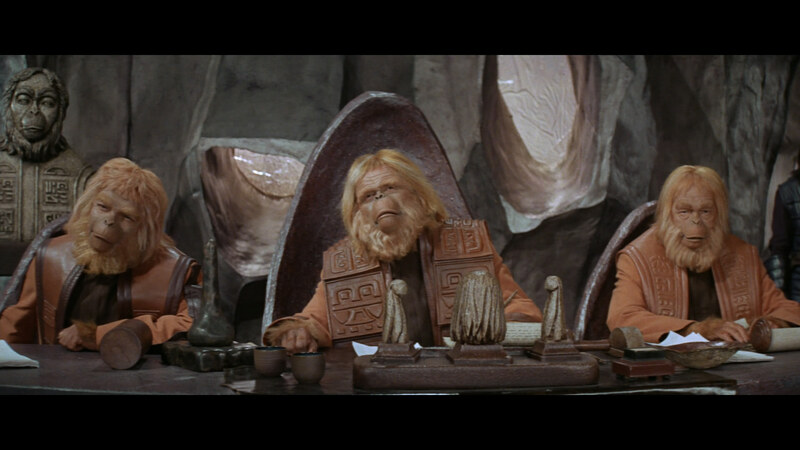 If you’re looking, the influences of Serling’s background and ethnicity on Planet of the Apes are obvious. Serling envisioned a society of the future in which elements of Judaism were clearly aped. The ape society is a theocracy, run by a priest-like caste of Orangutans. The Orangutans’ garments bear more than a passing resemblance to the breastplates and robes worn by the High Priests in the Temple. The apes believe in God, and that His prophet the Lawgiver set out the faith and wrote the Sacred Scrolls. The apes revere “the Lawgiver.” The Lawgiver holds the position of a prophet in a similar fashion to Moses. Their religious laws, which are set out in the Sacred Scrolls, are the state laws. They combine the Old Testament with the American Declaration of Independence. The film’s protagonist, Charlton Heston, while himself not Jewish, had previously starred as Moses in The Ten Commandments (1956) took the title role in Ben-Hur (1959). These past roles add something to the idea of his character, George Taylor, as a wandering ancient Hebrew, lost in the wilderness of space, stranded from his home planet. Beyond the simple ape vs. human allegory in the film, the caste system of the apes is also clearly racially motivated. So we have another layer. The Orangutans represent the ruling elites or the WASPs blinded by religion. The gorillas are hunters, soldiers, and menial labourers at the bottom, and serve to symbolise African Americans. (So here the humans would represent animals). DR. ZIRA: You don’t sound happy in your work. DR. GALEN: I’m little more than a vet in this laboratory. You promised to speak to Dr. Zaius about me. DR. ZIRA: I did. You know how he looks down his nose at chimpanzees. DR. GALEN: But the quota system’s been abolished! You made it, why Can’t I? DR. ZIRA: What do you mean, made it? I’m an animal psychologist, that’s all. We have no authority. The chimpanzees use their position to challenge the planet’s racial hierarchy and to champion the cause of the underdog, in this instance, the captured human, Taylor. Serving as his advocate, and ultimately freeing him from imprisonment, the chimpanzees’ actions recall those Jews, who assisted in the Civil Rights campaign of the 1950s and 1960s. It is worth remembering this history as we watch Dawn of the Planet of the Apes. The latest instalment stars Gary Oldman as a character named “Dreyfus”. Loaded with resonance, this name could refer to the wrongly-disgraced French-Jewish army captain, Alfred Dreyfus, or to the obviously-Jewish physician, Dr. Dreyfuss, of Billy Wilder’s The Apartment (1960). It could also be read as a nod to the underlying Jewishness of the original 1968 movie which inspired the current film.